Only three short months ago, Andrew got down on one knee and asked Kiley marry him. Now here she was, standing in a beautiful old Victorian-era house, slipping into her wedding dress. Soon she would walk down the aisle and promise to spend the rest of her life with the man who ate late night pizza with her and read Harry Potter books with silly accents throughout college. Kiley and Andrew, your wedding was absolutely gorgeous and Lucas and I were so, so honored to be a part of it! We hope you're having a fantastic adventures together- exploring Mayan ruins and learning to scuba dive! Thank you for allowing us to document your love, and Lucas and I pray the Lord will bless and guide you as you begin your lives together! When Lucas and I arrived at Chestnut Square Historic Village, it felt like we were traveling back to a slower-paced, more gracious time. 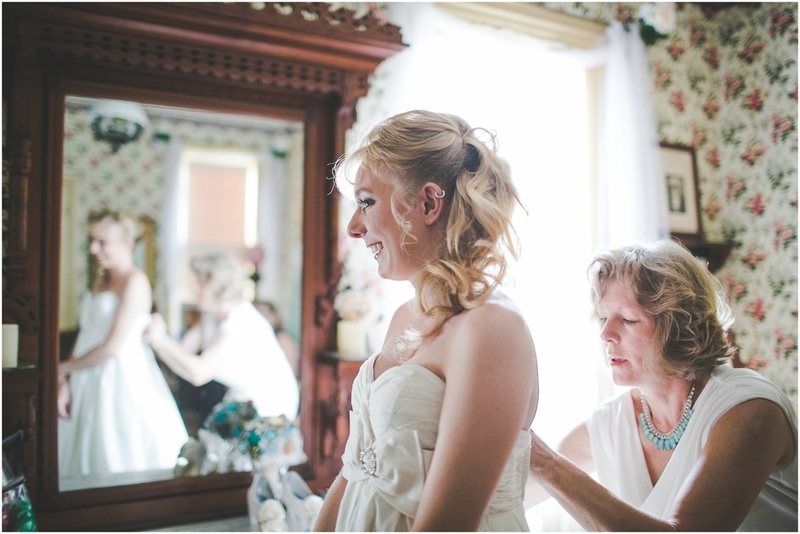 The girls got ready in a gorgeous Victorian-era house-- It was the PERFECT backdrop for their vintage-styled details!